Let's experience the spirit of Eid together! While we eat lontong, rendang, and many festive foods during Eid, they are small groups of people who have never been able to see Eid as we are. These groups fall under the families that have their breadwinner in prison due to drug issues. The ones that they hurt is not just them but the family they leave behind fending for themselves in this tough society. In this project, we may not be able to solve every single one of the family issues but here we have identified about 500 families and we hope these Raya hampers will uplift their spirits this Eid. Our Raya hampers will be distributed to Hira society beneficiary. Your contribution will help former drug addicts' family in providing some reliefs in preparation for this coming Raya. Hira is a body or entity that was established for the development of social and moral education especially those whose family members are involved in drugs or crime. The way to approach this group is through the method and wisdom of the contemporary science and psychology in developing a well educated and successful community. • Focus on helping drug addicts and ex-drug addicts and their families achieve educational and social success. 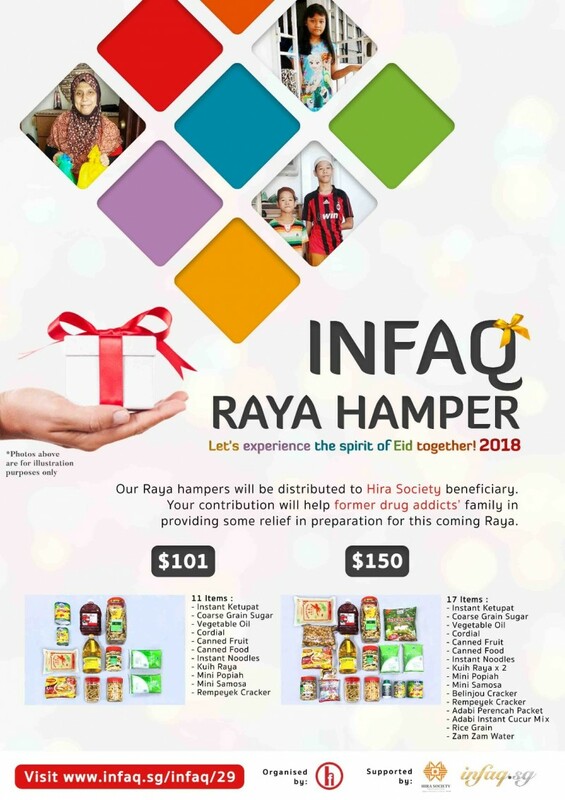 This is the second year this project has been organised by HEZOM XPRESS PTE LTD.
*Distribution of the hampers will be organised in the third week of Ramadan and will be done by Hira Society volunteers. * Banking and admin fees are included. * Take note banking fees have not been included in the above prices. * All funds will be directed to HEZOM XPRESS PTE LTD who is managing this project.